The STEEM price is up 2.63% verse the USD over the past 24 hours on lower volume ($7,580,340) as Bitcoin is up at $7.5k and the broader market is up. 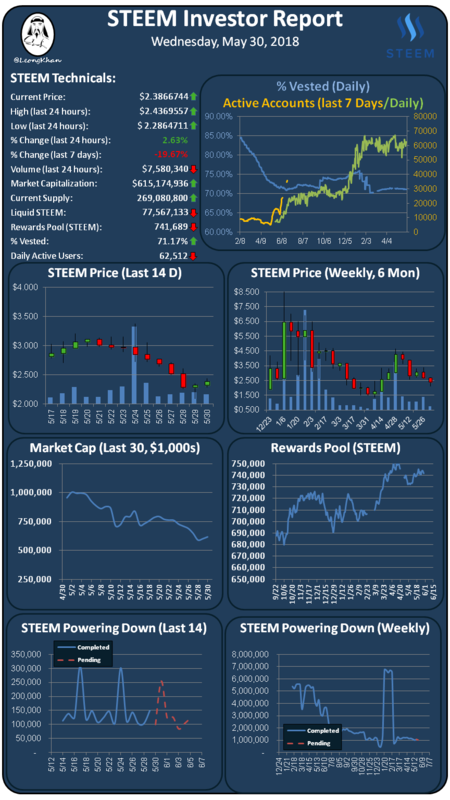 STEEM is up slightly verse Bitcoin as Korean trading is flat at 17% of the trading volume. New account creation is strong at 700 accounts created in the past 24 hours. The % vested indicator is up at 71.17% on lower power downs at the lower STEEM price level. Daily active accounts is down slightly at 62,512 accounts executing transactions in the past 24 hours. SBD is at $1.72 on Bittrex which is still very elevated over the peg, receive you rewards in 50% SBD and then use the SBDs to buy STEEM on the exchange. SBD conversions are a waste of money again! As trader you might be interested, check and follow us back! We AI-powered Trading Ecosystem. Good informative article STEEM Investor Report. Congratulations @leongkhan! You received a personal award!